Vigilante group RAAD have claimed responsibility for an attack on a PSNI patrol in Derry during aggressive Crown force raids in the nationalist Creggan area last weekend. The intensity and frequency of PSNI operations in Creggan have increased significantly in recent weeks, provoking several protests and two mini-riots. A group of residents, Creggan Women United, held a protest at Creggan shops to highlight their concerns after three days of raiding by the police. “They have been heavy-handed,” spokeswoman Josephine Canning said. “On Saturday they came into this area in riot gear to deal with children. That was before a stone was thrown. RAAD (Republican Action Against Drugs) said it had targeted the PSNI because of what it described as “the increased and even more brutal attacks on republicans and their families”. A hurled pipe-bomb damaged the front of a police jeep. There were no injuries. It is the first time RAAD has mounted an attack against the Crown forces. Previously, the organisation targeted only members of the nationalist community for so-called ‘punishment’ attacks. The group said it used “a newly developed explosive device” to carry out the attack and warned that it would step up attacks “as long as the security forces victimise republican areas”. RAAD also claimed that the recent searches and arrests in the Creggan area had been instigated by Sinn Fein, accusing one party member of “conniving by phone” with the PSNI during a recent search. But the party's Deputy Mayor of Derry, Kevin Campbell, challenged the PSNI to “explain its strategy” over the raids in Creggan at the weekend. He said residents believed the raids were nothing more than “community punishment”. The councillor added that the actions threatened to destroy any good work to build community support for policing in the area. On Monday night, a promotional event for the London 2012 Olympics was disrupted by a protest against the police harassment. Creggan residents became involved in a confrontation with the PSNI near the new ‘peace bridge’ in the city, which forced the torch-relay event to take a slightly different route across the bridge. 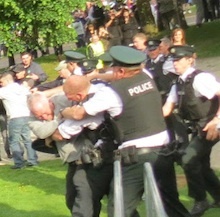 There had been a huge PSNI presence in the area for the event. One protestor was arrested. The 32 County Sovereignty Committee denied descriptions of the incident in the mainstream media as a ‘dissident’ event intended to disrupt the Olympics. “It was a protest by people who have now been forced to endure successive nights of house raids and intimidation by the PSNI,” a spokesperson said. “During these raids people have had their community flooded with heavily armed British police who have assaulted residents and traumatised children. “The focus for the media should not be a disruption of a few minutes to the route of the Olympic torch but to the daily disruption the residents of the Creggan area are forced to endure at the hands of the PSNI. In a separate incident in west Belfast, a breakaway IRA group Oglaigh na hEireann claimed responsibility for a grenade-style attack on the PSNI. A device exploded after it was thrown at a PSNI vehicle in the Whin Park area of Twinbrook shortly after midnight on Wednesday, causing shrapnel damage. Two local residents’ cars were damaged in the blast. It is the first time the group has launched a direct attack on the PSNI in over a year. A Belfast-based journalist said he received a statement from the organisation which said it had mounted the ambush only after it had “patiently waited” to avoid any risk of civilian casualties. The group also vowed that more attacks would follow, he said.